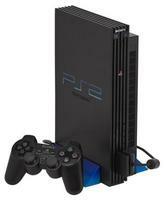 Each Playstation 2 System comes with one controller, the power cord, and the AV cable. Everything you need to start playing the PS2 system will be available right out of the box, except for games, which are sold separately. The Playstation 2 system allows you to play such great games as Final Fantasy X, Grand Theft Auto, Metal Gear Solid 2, and Madden Football. The PS2 Console also plays original Playstation games so there are literally thousands of games available.